Tim “Swanky” Glazner’s book all about the Mai-Kai came out at the end of last year. He’s about to embark on a big West Coast tour to promote the book, culminating in a presentation at this year’s Tiki Oasis in San Diego. The Mai-Kai is an historic icon of a restaurant, operating for over 60 years in Fort Lauderdale, Florida, the grandest and best-preserved of the classic mid-century Polynesian restaurants. Of all the restaurants that could have survived from that era, it is the best, and we’re lucky to get to experience its extravagant example of living history today. Swanky’s book, “Mai-Kai: History and Mystery of the Iconic Tiki Restaurant,” is an outstanding and detailed exploration. It’s a heavy, hardcover treasure, 174 large, full-color pages, packed with incredible images you’ve never seen before. He worked closely with the restaurant, diving into their archives, and interviewed scores of people who were there from the very earliest days of the Mai-Kai, especially original general manager Bob Van Dorpe. Often when we’re talking about the history of mid-century Polynesian restaurants, the names that get the focus are ones like Donn Beach and Vic Bergeron—and in the case of the Mai-Kai, Jack and Bob Thornton, the brothers who created the Mai-Kai. But once you dig a bit deeper, you hear the names of the people they brought on board to execute their dream; people who added their own experience and vision to make these places come to life, giving form through their artistry, personality and good old fashioned effort. These people were far more likely to be people of color, and women—people whose stories are too often lost. People like head chef Kenny Lee, head bartender Mariano Licudine, musician Toti Terorotua, performers Pua Kanemura, Dee & Angel Miller, Pualani Mossman Avon, Ann Campbell, and of course current-day Mai-Kai owner and widow of Bob Thornton, Mireille Thornton. In this book, these people are treated not as footnotes, but as the very fabric of the Mai-Kai, exploring their own backstories, singular contributions, and fun remembrances of their time at the Mai-Kai. And the stories are ones of glamour. What a way to relive this era! The pages are dotted with celebrities enjoying life: Johnny Carson and Ed McMahon (well-known fixtures at the Mai-Kai), Jayne Mansfield, Elizabeth Taylor, Bob Hope. Every page is jam-packed with eye candy, from the candid photos of elegant people cutting loose, to the gorgeous artifacts like rare early serving vessels and ephemera. The Mai-Kai did not occur in a vacuum, of course. To learn the story of the Mai-Kai, you must learn how it was born, which means digging into the history of Don the Beachcomber’s Hollywood and Chicago locations, which fed straight into the Mai-Kai. Anyone who is interested in mid-century Polynesian restaurants owes it to themselves to spend some quality time with this book and its stories. The best place to buy Swanky’s book is of course at the Mai-Kai‘s gift shop, but you can also find it from Amazon and other book retailers. If you’re on the West Coast, come talk to Swanky yourself! 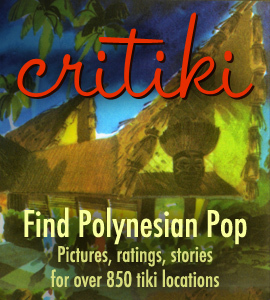 Swanky has added his upcoming visits for his tiki tour to Critiki. We’re just hanging out, but I’ll probably have him sign my book, so I guess that counts as a book signing?